How are the beads made? 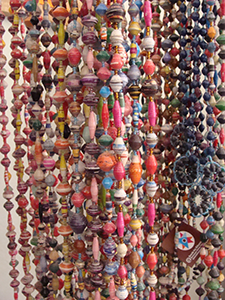 Our bead makers collect colourful recycled paper, usually in the form of old calendars, cereal boxes, pamphlets or magazines, which are then skilfully cut into a series of small triangular shapes. These shapes are tightly rolled and glued, to form a unique bead shape and colour before being strung and coated with a minimum of four coats of quality varnish. The result is a unique piece of jewellery. ‘I am 23 and a mother of three children. I left school in primary four after the death of my father. I had my first child when I was 13. Later I got married and had another child but at the age of 2 years he was not walking or talking so I took him for an HIV test and the result was positive. We separated and I went back home with the children, to live with my mother. Twelve months later I had a skin problem and had a HIV test which was positive and so I was started on the drugs.